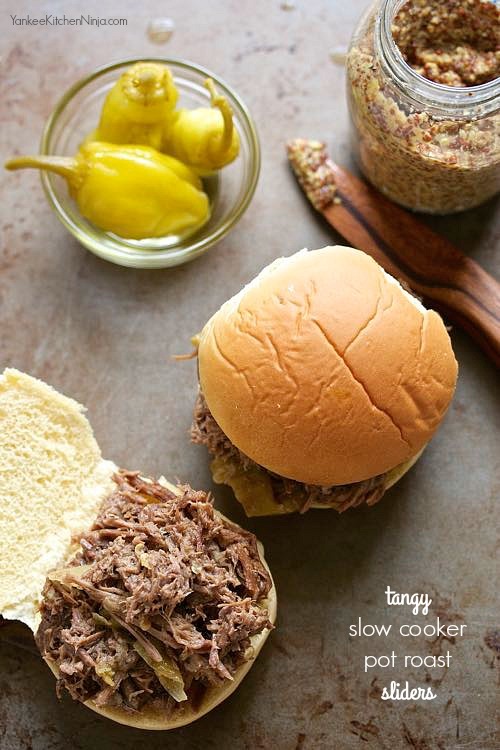 Update your Sunday pot roast with this tangy riff, made in the slow cooker and turned into sliders for an easy weeknight meal with leftovers. Pulled pork is one of my all-time favorite things to make in the slow cooker. And I think you're well aware of my penchant for transforming chicken into all sorts of awesome dishes in my crockpot. I don't know why I never really thought to do any kind of beef cut in the slow cooker. So when I saw this article in the New York Times about a slow cooker beef roast with some interesting spicy flavors, I knew I had to give it a shot. Apparently, there's a version of this beef that went viral via Pinterest (called "Mississippi Roast", for some reason) -- but it calls for packaged dressing AND gravy mix. Ugh. No way -- you know that's not how The Ninj rolls. Especially when it's just as easy and no less time-consuming to use real ingredients. Which is what's happened here. Try one of four original recipe riffs on the classic Bloody Mary, often called the World's Most Complex Cocktail. As a contributor to Edible Green Mountains magazine, I recently wrote an article on the Bloody Mary, often called the world's most complex cocktail. 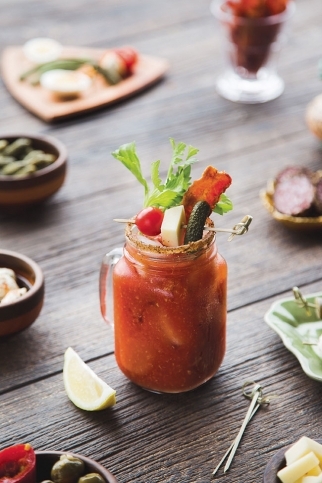 I opened Pandora’s box recently by naively asking a group of friends what makes the best Bloody Mary. Their responses were as varied as those of a group of four-year-olds being asked to name the single best Christmas gift. My friends offered up renditions sweet, savory, classic, outlandish and everything in between—and each was adamant that his or hers was the best. What I have learned is that this variety and lack of agreement applies to nearly every aspect of the Bloody Mary—not only the ingredients but also its very invention and namesake. There’s a reason that the Bloody, as its most ardent fans familiarly call it, has been dubbed the world’s most complex cocktail. 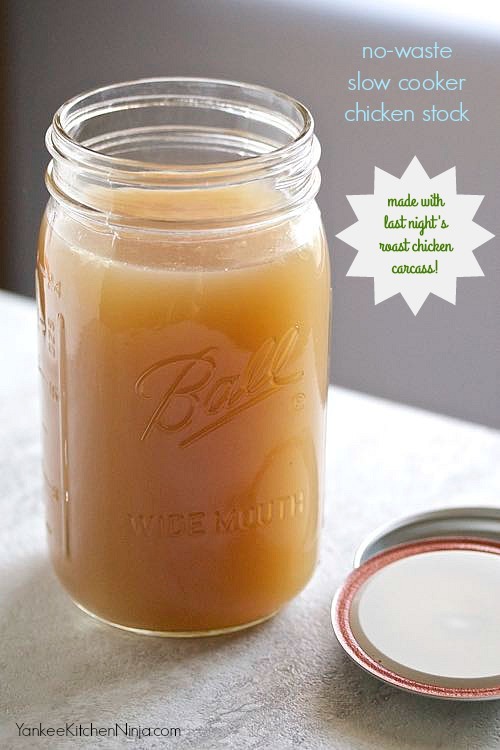 Learn how to make recipe-ready, freezable slow cooker chicken stock from only the bones of a roast chicken, a handful of veggies and water. This is one of those recipes for DIY pantry staples that has been in my repertoire for years yet I haven't shared it with you yet. Shame on me! I think it's because it's one of those not-really-a-recipe recipes that hasn't seemed "worthy" enough. Until now. Because I've been crockpot cray cray lately, as regular readers well know. If you've never tackled homemade chicken stock, this slow cooker version will change your mind. It's not at all time-consuming because, well, SLOW COOKER. Plus, all you need to make it is the carcass of your last roast chicken (read: NO WASTE! Practically composting! ), some common veggies you've likely always got in your fridge, some spices and water. Talk about making something out of nothing! Here's what you do: The next time you make a roast chicken, be a little less thorough than you might be when carving it -- leaving a little bit of meat on the bones means a more flavorful stock. 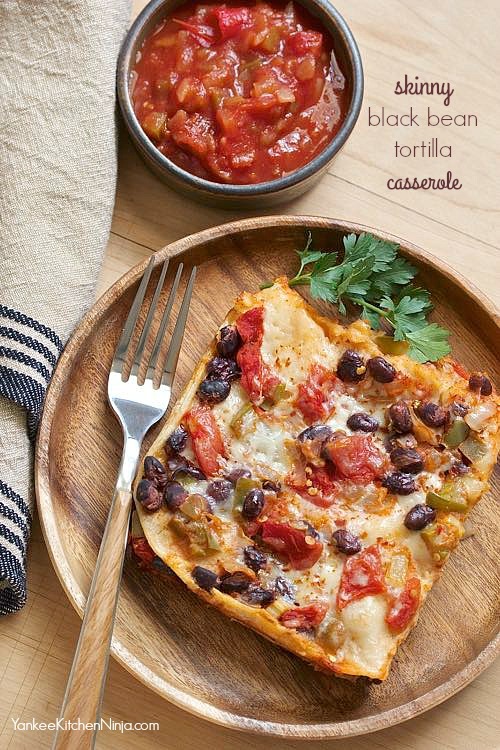 Skinny black bean tortilla casserole is a healthy, fast and easy way to add a satisfying meatless meal to your weeknight dinner rotation. This may sound really weird but it's really exciting: I've rediscovered the public library. I told you it would sound weird. I mean, where did it go that I had to rediscover it, right? 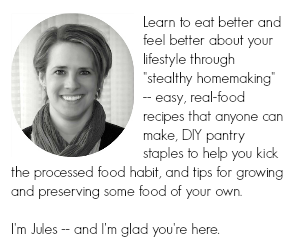 I grew up as a library power user: in elementary school, I couldn't wait for summer, not just for the swimming and playing outside and not attending class part but also for the summer reading program at my tiny local library. Whether I knew it or not, I was a lot more Type A back then and the reading program had a contest for which child could read the most books: Let's just say I rose to that challenge and then some. Not to mention that I just loved spending time in the library itself. It seemed magical to me that I could wander around, browsing through a seemingly endless supply of novels, taking as long as I liked to make my selections and then I was allowed to just take them home. For free. It was better than a candy store for an avid reader. Even as an adult, I made weekly visits to the library after work to refresh my book pile, largely because I tried to spend my lunch hours reading the novels I so love. The number of books I read each year was a little mind boggling. But then something changed all that: We moved to a tiny town in Vermont. This healthy chicken corn chowder is made effortlessly in the slow cooker -- an easy and satisfying weeknight comfort food dinner. I'm back with another slow cooker recipe. Seriously: I've been on a slow cooker tear lately -- largely because I am single-handedly painting the interior of our new house (I know, I'm insane. Or just cheap. Or both). As you would guess, this is more than a bit time-consuming and tiring. By the time I finish up for the day, the last thing I want to think about is making dinner. And you know how I feel about take out. Well, I might consider it if there was any place other than Domino's in my new 'hood that delivered to a house beyond walking distance from the local university... but there's not. So I've been focusing on making the easiest weeknight dinners possible. Which is why I'm working my slow cooker overtime. 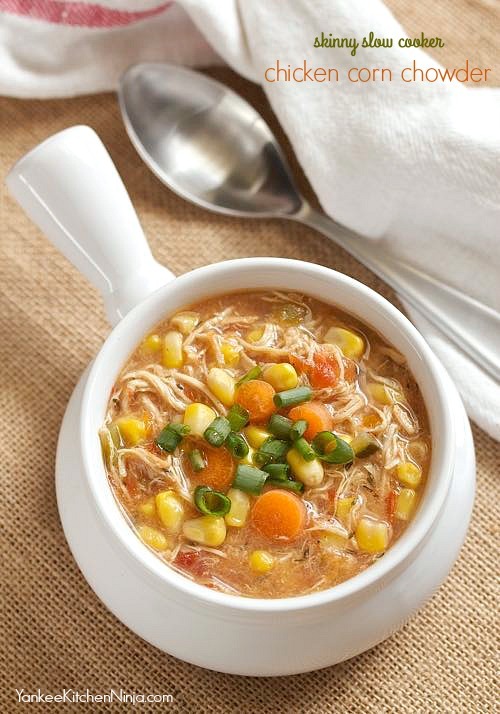 Especially with no-prep-required slow cooker recipes, like this skinny chicken corn chowder.